Wisdom : The Two-Way Wisdom, a Laysan albatross who nests at the Midway Atoll National Wildlife Refuge in the North Pacific Ocean, is thought to be at least 62 years old. She's raised an estimated 30 to 35 chicks over the years and flown at least 2 million miles, scientists say. 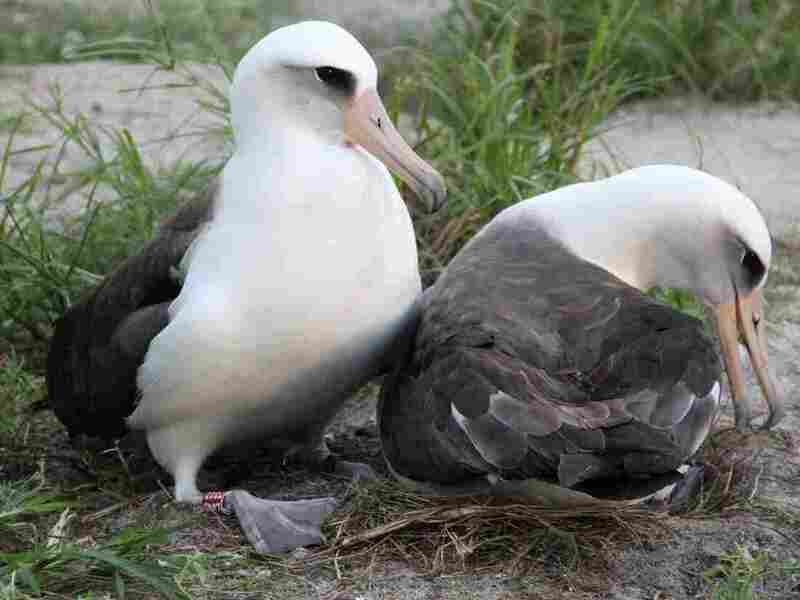 Wisdom (left) and her mate on their nest last November at the Midway Atoll National Wildlife Refuge. U.S. Fish and Wildlife Service biologist Pete Leary is proud to announce that Wisdom the Laysan albatross, who at age 62 (or so) is the "oldest known wild bird" in the world, has hatched another chick. Wisdom's latest offspring "was observed pecking its way into the world" on Sunday at the Midway Atoll National Wildlife Refuge in the North Pacific Ocean, the agency says. Some Two-Way readers may remember our post from March 2011, when Fish & Wildlife Service officials were relieved to report that Wisdom had survived the tsunami that roared east from Japan that month and sent a 5-foot tidal wave crashing into the wildlife refuge where she spends part of the year. Now, we're glad to pass on the word that Wisdom is apparently still doing fine and still up to the demands of motherhood even though she's well beyond the 12-to-40 year average life span of a Laysan albatross. Wisdom was first tagged by researchers in 1956, when she was already at least 5 years old. According to the Fish & Wildlife Service, she has worn out five bird bands since then. It's thought that she has "raised at least 30 to 35 chicks during her breeding life" and is known to have "nested ... every year since 2008." "At least two million to three million miles since she was first banded. Or, to put it another way, that's four to six trips from the Earth to the Moon and back again, with plenty of miles to spare." "Laysan albatross breed on the Hawaiian islands of Oahu, at Kaena Point, and on Kauai, at Kilauea Point. Their feeding grounds are off the west coast of North America, including the Gulf of Alaska, and they spend their first three to five years constantly flying, never touching land. Scientists believe they even sleep while flying over the ocean." All Things Considered is planning to have more about Wisdom later today. We'll add the audio of that conversation to the top of this post later. Click here to find an NPR station that broadcasts or streams the show. More albatross news: "Albatross That Hitchhiked To L.A. Is Freed To Fly Home To Hawaii." Update at 2:45 p.m. ET. How Do They Find Her? Along with being monogamous, albatrosses return to the same spot each year to mate and nest, says John Klavitter, a wildlife biologist and deputy manager at the Midway refuge. So, as he told NPR's Robert Siegel this afternoon, it hasn't been hard to watch for her each year when the birds return in the fall. Asked about whether it's likely Wisdom's mate has been the same male all these years, Klavitter said it's possible — but he doesn't have a band so the researchers don't know just how old he is. And, Klavitter added, it's unlikely her first mate has survived this long. Wisdom's survival, Klavitter said, is amazing. She has to have "overcome so many obstacles" over the years, from predators to the tsunami to the daily hazards from pollution, boats and other threats. Update at 2:30 p.m. ET. How Many Mates? Some commenters have wondered about these birds' mating habits. According to the Fish & Wildlife Service and other sources, albatrosses do mate for life. But given Wisdom's age, as The Washington Post notes, she "probably had to find a new, younger mate maybe twice down the line. The Post also tracked down the scientist who first banded Wisdom in 1956. Chandler Robbins, a retired senior scientist with the U.S. Geological Survey, is now 94. It was on a return trip to the atoll in 2001 when he "picked up a bird with a tag that traced all the way back to one with a signature he recognized — his own. That's when scientists got excited and gave Wisdom her name."